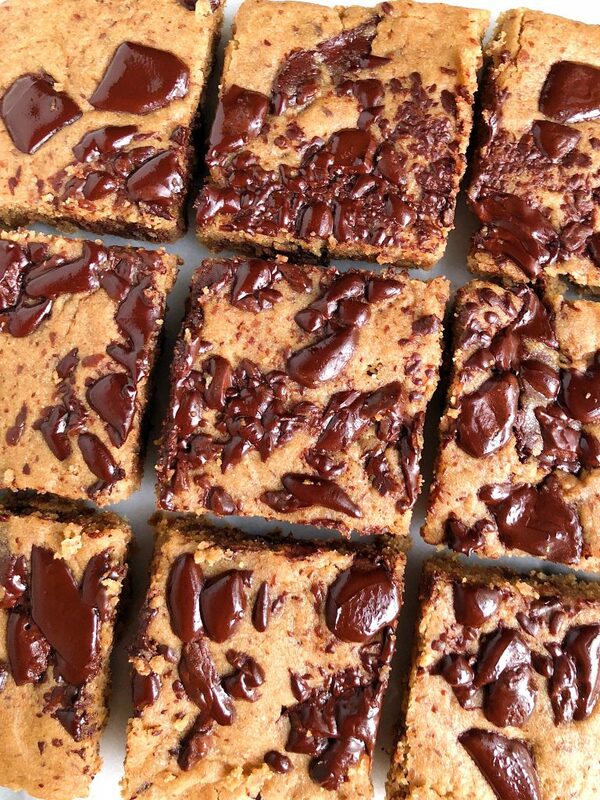 One-Bowl Dark Chocolate Tahini Blondies made with vegan, nut-free, gluten-free and no refined sugars! So cakey and delicious! 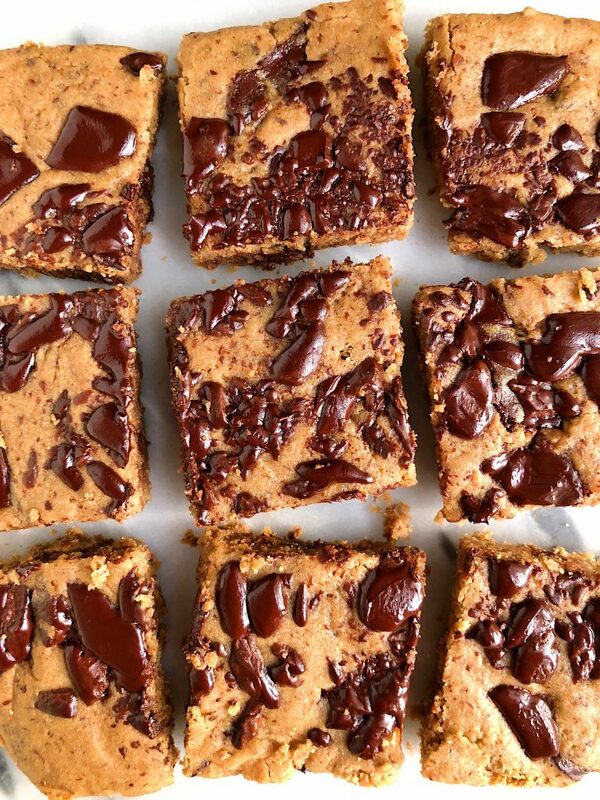 It’s been awhile since we made some BLONDIES over here on the blog. Blondies are such an underrated dessert recipe if you ask me. They pretty much combine a chocolate chip cookie, cake and brownie into one. There’s that vanilla cake-like flavor, brownie consistency and the melted dark chocolate just gets me every time. 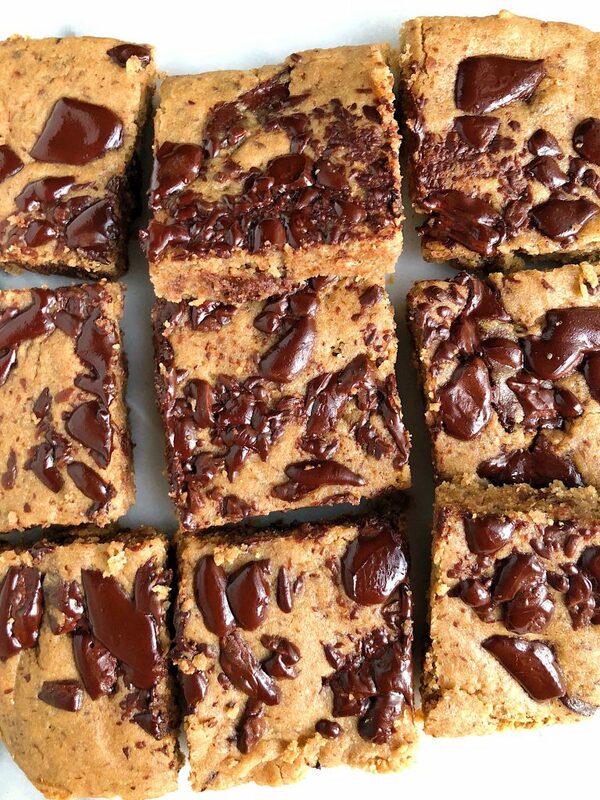 These new Dark Chocolate Tahini Blondies are vegan, gluten-free and nut-free. Basically a trifecta in the dessert world. This recipe is good for most allergies then and is a crowd pleaser! I use creamy tahini instead of nut butter, flax eggs instead of eggs and my favorite homemade gluten-free oat flour made with One Degree Organics Sprouted Gluten-free Oats. I also love that this recipe is made in ONE BOWL. So there is no crazy annoying clean up with two bowls at the end. Add all the ingredients together, mix, fold in chocolate and bake to perfection. You have definitely seen One Degree Organics here on the blog a lot. They are truly an amazing brand with some of the best products around. I love that they offer all quality flours, cereals, granola, seeds, anything! My pantry looks like a grocery store shelf selling their products and I wouldn’t have it any other way. They are truly a special brand, so please do try their products when you see them in stores! These blondies are slightly sweet (just the right amount if you ask me) and they taste delicious warmed up or even cold in the fridge. Dipped in some almond milk and you are in business friends. Don’t forget to share with me on Instagram if you make them! Cannot wait to hear what you think. Here are a few of my other favorite recipes using One Degree’s products: One-Bowl Carrot Cake Loaf, Healthy Vegan Cinnamon Rolls and Mini Vegan Banana Bread Loaves. Bake in oven for 20-25 minutes, allow them to cool and enjoy!